Jockey boxes - coil or plate, copper or steel? If you want to serve your beer nice and cold at a party or BBQ, then a jockey box beer dispenser is a great way to share your nut brown ales. The jockey box, is a container filled with ice and water. A long coil of hollow tubing is connected to an external supply of beer, the other end, to the beer faucet. As the beer is drawn from the box through the coil, the beer is cooled by the cold temperature of the water. A simple, yet handy solution. The longer the coil, the more contact time the beer has with the cold, thus allowing the beer to get to a nice serving temperature. A good jockey box will be insulated to ensure the ice remains frozen as long as possible. An ideal temperature is considered to be 32°-33° Fahrenheit. If your ice melts and you've got an all-day event you may wish to have a supply of spare ice to top the box up with. 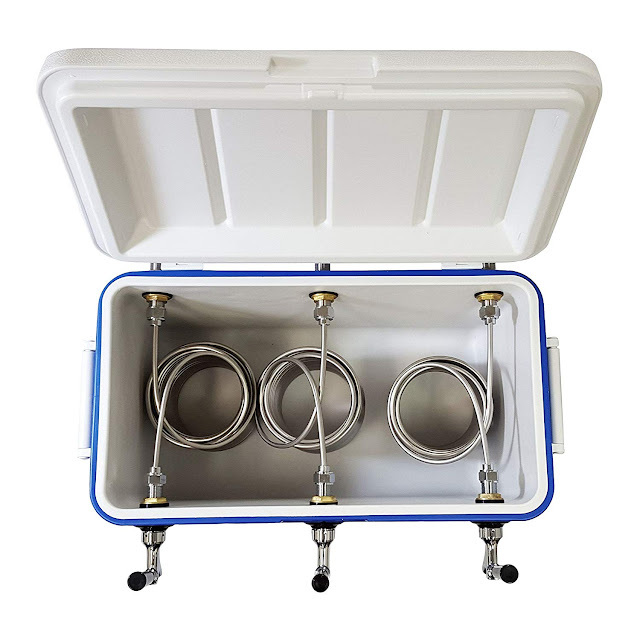 This 28 quart / seven gallons jockey box cooler features stainless steel coils that are superior to boxes with cold plates because there is much more tubing, allowing for a much greater cooling capacity. This unit is double trouble as it comes with two 50' stainless coils that are 5/16" outside diameter meaning you will get good beer flow. Featuring two chrome faucets with black handles this unit also comes with includes bonus faucet wrench. This is a basic set up, for fair value. Check out the price on Amazon. Coldbreak is slowly but surely earning itself a fine reputation for selling quality brewing gear. They state that their jockey boxes are built specifically for the craft beer industry and designed so your beer has 100 per cent contact with stainless steel. Which is just what you should be looking for. All the shanks, coils, ferrules, and faucets of this unit are all made from stainless steel. Their Bartender Edition line of jockey boxes have the liquid inputs on the same side as the faucets. This gives your jockey box a clean look from the 'patron' side and also allows your bartenders to see if your keg is about to blow. 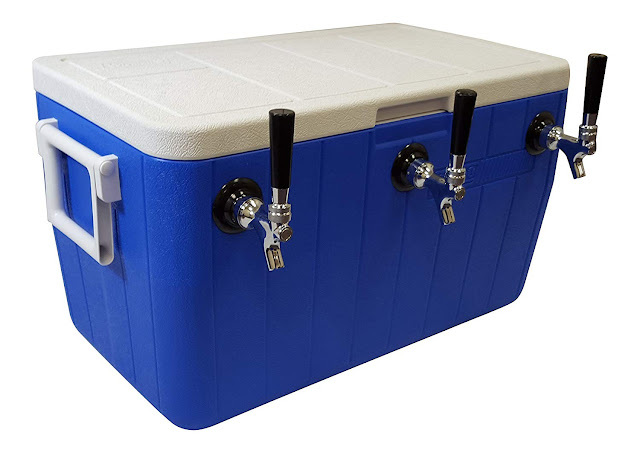 NY Brewing proclaim their jockey box cooler is perfect for dispensing ice cold beer at any party or event. Simply fill the cooler with ice and water, attach your keg(s), and you are ready to pour cold beer. They also reckon that their stainless steel coil jockey boxes are superior to those with cold plates because there is much more tubing, allowing for a much greater cooling capacity. Comes assembled with instructions for use and care. What's better, a stainless steel or plastic jockey box? There are pros and cons of using each. Plastic is lighter but less durable. Stainless is heavier and stronger. A quality jockey box made of steel would have had all its shanks, coils, ferrules⇉, and faucets made from stainless steel. Shank plates should be in place to reinforce the cooler's walls to prevent buckling of the unit which is really important as this will help ensure that you are properly able to tighten your faucets. Nothing worse than a leaky faucet than when beer is involved! Why can't I just place my keg in a bucket of ice rather than use a jockey box? There are two schools of thought on this and the thinking can get muddled. You sure are very free to cool down your keg with ice but it's an intensive process which requires a lot of ice and time to cool the whole keg, especially if it's full of delicious beer. If you can get the beer cold enough, you might not need a jockey box but they are still handy for serving. 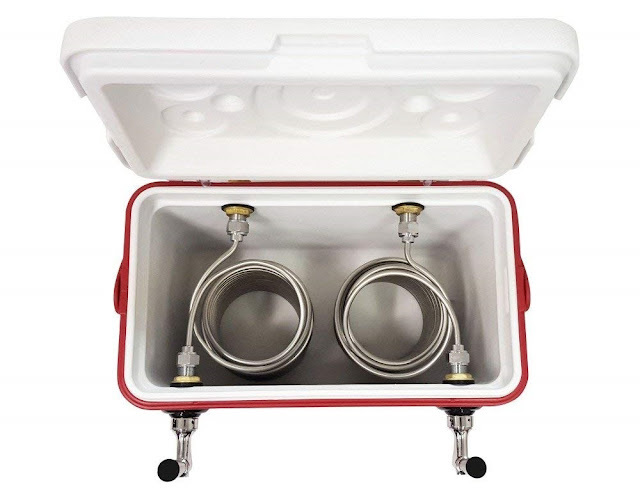 A jockey box is an easy setup, doesn't require as much ice and arguably it cools the beer faster due to the coil system which means the beer gets exposed to a lot of coldness. THAT said, warm kegs will likely serve foamy beer. That means there's nothing wrong with keeping your keg out of the sun when using a jockey box - try and keep it in the shade, or use an umbrella or at least a towel to prevent the sun heating the keg too much, thus countering the effect of the dispenser! This is actually quite an important thing to consider because as the temperature of the keg rises, the PSI changes with it, thus affect the pouring of the beer. So to round off, if you are using a jockey box, it also helps to keep the keg cool, at the very least, try and prevent it from warming in say direct sunlight. How do I set up a jockey box? Do I need a regulator? What kind of PSI is required? These three questions are lumped together as they go together. The beer line from the keg goes from a shank into the keg and then into the coil and out the faucet. The keg should be connected to a CO2 tank to carbonate the beer and assist with pouring the beer. If you need a quick pour, you'll want to use a shorter coil system, say the standard 50' foot length. However if you are doing a continuous poor, then you could perhaps go up to 120' feet and get a cooler beer depending on your conditions. This difference may mean you need to adjust the PSI pressure of the CO2 up a little higher for the longer coil. Typically, a PSI of 25 is used. Here's a great instructional video which clearly demonstrates how to hook up the CO2 regulator to the keg and then the piping to the jockey box. You need to flush the pipes out! If you don't clean the piping and coil, you'll get nasty residue left over which is just gross. Flush them out with water until they run clean. Consider using some pipe cleaner, especially after several uses to prevent and remove any build up. What about using a plate cooler over a coil? You can totally use a plate cooler - however, there's a real drawback with them in that you can only have ice and you'll need to keep in refreshed with ice and drain any melted water. As I understand it, cold plate coolers work best if the keg itself is cooled, which as we've discussed is good practice. The coil system, of course, loves ice and water. What's the difference between a kegerator and jockey box? A kegerator is a permanent set up which is basically a fridge. It's perfect for the man cave. 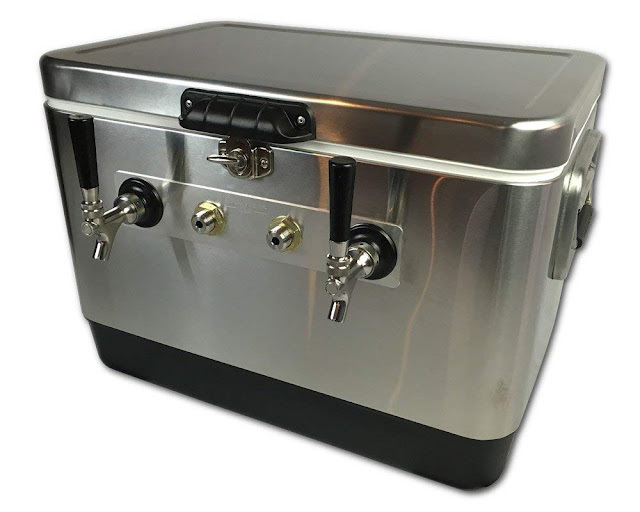 The jockey box is a portable unit, designed to allow for pouring stations at parties, beer tastings and the like. 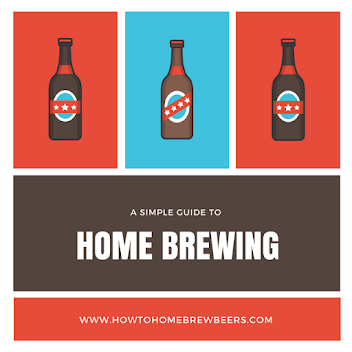 How do I make a hops tea for home brewing?